To the venerable lord protector, indivisible, I deeply bow. Renowned as ‘For the Benefit of Beings Pervading Space’. 1) At the Outset, the Preparation of Refuge and Bodhichitta. 2) The Actual Practice, the Meditation on the Deity. 3) The Recitation of the Mantra. 4) The Post-meditation Technique of Carrying the Practice onto the Path. 5) The Dedication of the Virtuous Roots for the Benefit of Others. 6) The Teaching on the Benefits of this Practice. I go for refuge until enlightenment. This constitutes going for refuge. In the space in front of you is the essence of the root guru, Arya Avalokiteshvara, inseparable from the Three Jewels. In the midst of an assembly of living beings composed of yourself and others, your friends, enemies, and neutral persons, one goes for refuge until one is permanently liberated from the causality of samsara and reaches the state of omniscient enlightenment, out of a faith that comes from unshakeable trust, a yearning that longs for protection, and a genuine threefold confidence in their assistance. May I accomplish Buddhahood in order to benefit beings. This is the generation of the mind of bodhichitta. Beautifully smiling, he gazes with eyes of great compassion. The HRĪH syllable, like the color of a pearl, is extremely white, and from it rays of light uninterruptedly dazzle forth. Meditate on it as the consummate identity of the power, strength and blessings of all the Victorious Ones of the ten directions without exception. From this HRĪH, light, like moon-beams, issues forth. This is offered as unsurpassable offerings to all the mandalas without exception of the vast array of Victorious Ones, thus pleasing their enlightened body, speech, and mind. Their blessings, power, and abilities are gathered together as light, and this light is reabsorbed into the HRĪH. Once again, from the HRĪH, light issues forth. As these light rays touch oneself and others, all sentient beings, sickness, harmful energies, negativity, obscurations, and suffering, together with their causes and origins, disturbing mental states and karma, are purified and cleared away, and all are established in happiness. Then again, as a consequence of the rays of light dissolving into each of the HRĪH syllables on the crowns, in a single moment, Avalokiteshvara, the Supreme Noble One, manifests, the color of his body like snow glistening in sunlight, extremely white and brilliant. He radiates five-colored light, which touches the pure fields of the vast array of Victorious Ones, inspiring those Victorious Ones to work for the benefit of beings. Again, the light rays fill the abodes of the six classes of beings, clearing away their respective sufferings along with their causes, and uniting them with bliss and positivity. As Avalokiteshvara’s awakened heart is utterly delighted by all sentient beings, oneself and others, he has a beautiful expression. Like the love that a mother has for her only child, he ceaselessly looks upon all beings with his two all-seeing eyes that are imbued with the smiling glow of affection and caring. The lower two hold a crystal rosary and a white lotus. And over his shoulder is the hide of deer. From among his four hands, the first two are joined together at the heart, palms together; the lower left holds a crystal rosary, and the one on the lower right holds a white lotus with eight petals and a stem. He is beautified by white silk covered in brilliant gold designs and hanging from his shoulders. He has as lower garment of red silk. All the parts of his body are elegantly adorned by a myriad of various kinds of ornaments, such as a jeweled crown ornament and so on. The hide of the Krishna deer, golden in color, covers his left breast. And a stainless moon supports his back. He is the consummate essence of all sources of refuge. At his crown he has a crest ornament at the peak of his ushnisha, upon which is the Lord of the Family, the Buddha Amitabha, in nirmanakaya garb. His two legs are in the vajra-asana, and his body is supported by a back-rest of a moon, devoid of all blemishes and vast. Vividly meditate upon him as the presence of the unchanging embodied essence of all the Precious Supreme Ones, the sources of refuge that are the Victorious Ones of all directions and times. 1) Invoking the enlightened mind-stream of the Noble One through prayer. 2) Engaging in the deity yoga of the three doors by means of the sending forth and re-convergence of light. I pay homage to Avalokiteshvara. Since the Guru Avalokiteshvara is the supreme guide of infinite beings, he is called “Lord”. Here, it is also good to add any other appropriate blessing-imbued prayers. Light radiates from the form of the Noble One. Impure karmic appearances and confused perceptions are purified. The outer universe is the pure land of Sukhavati. Are the enlightened body, speech, and mind of Avalokiteshvara. Praying with single-pointed trust and the faith that “Whatever happens, you know!” as before, the enlightened mind-stream of the Noble One is invoked. Through this, extremely luminous five-colored lights stream forth, immeasurably, from all the parts of the enlightened form of the Noble One at the crown of one’s head. These light rays, simply by touching yourself and the beings of the six classes, in that very instant, like sunlight touching frost, purify the karma of the impure three doors accumulated since beginningless time by the three poisons and the innumerable collection of faults. Likewise, the habitual tendencies of subject-object fixation grasping at the dualistic perception of “self” and “other”, as well as the cognitive obscurations, are purified. Everything is blessed as the dynamic mandala inseparable from the enlightened body, speech and mind of the Noble One, and form becomes inseparable appearance-emptiness, like a rainbow. Again, limitless light rays fill all the abodes of the six classes of beings, and, through this, all worlds of the outer universe are purified and become the pure land of Sukhavati. The bodies of all beings, the inner inhabitants, immediately become the enlightened body of the Noble One; all sounds, apprehended and non-apprehended, become the self-resounding roar of the Six-Syllable Mantra’s speech; and the deluded aspects of ordinary thought processes and mistaken cognition are purified and manifest as enlightened mind, the profound cognizance of the wisdom of awareness and emptiness inseparable. Meditate in this way. Then, for the main practice of the session, accumulate OM MANI PADME HŪM as much as possible. OM is the syllable subsuming the primordial wisdom of the Noble One’s five kayas. 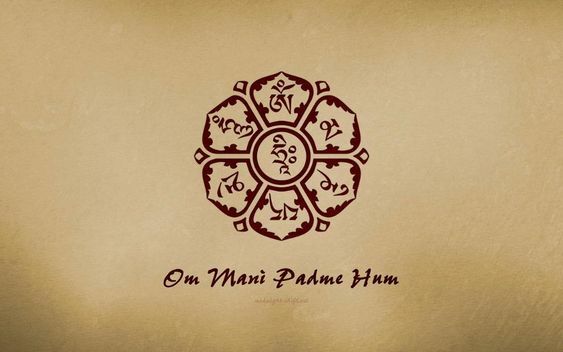 PADME is a name of the Noble One meaning, “Endowed with a Lotus” or “Endowed with a Jewel and Lotus”. HŪM is the mantra of enlightened activity which protects from the suffering of the six classes. Praying with the thought, “Quintessence of the five kayas and the five wisdoms, endowed with a jewel and a lotus, grant protection from the suffering of the six classes, I pray”, recite the Six Syllables as much as possible. Through the power of recitation in this way, you attain the power to pacify the suffering of the six classes within your own mental continuum, actualize the six transcendent perfections and six wisdoms, and attain the fruition of the level of the six Victorious Ones. And thoughts and concepts are the expanse of vast pristine awareness. Finally, through the radiance of the Guru’s form at one’s crown, the universe and its inhabitants, all of appearance and existence without exception, manifests as the Potala Pureland and the enlightened form of the Noble One. Dissolving into light, it all merges with the Guru upon your crown. He, too, also melts into light and dissolves into you. As you also melt into light, appearance, sound and awareness are luminous emptiness, apprehended as the deity, mantra, and dharmakaya, beyond all reference towards the three spheres [of agent, action, and object of action]. One must abandon all fabricated attributes of visualization, whatever they may be, and sustain for as long as possible the enlightened mind of the Guru, the all-embracing and non-compounded nature of clarity and emptiness inseparable: the vast resting into the continuity of non-meditation. When you arise from the above mentioned meditative equipoise, remain in the meditation that all dualistic phenomenal appearances, purified, are the enlightened body of the Noble One; all sounds, apprehended and non-apprehended, purified, are the enlightened speech of the Noble One, the melody of the Six Syllable Mantra; and all thoughts and concepts, purified, are the enlightened mind of the Noble One, the authentic unity of awareness and emptiness, the ultimate natural condition. Having rid yourself of the wrong conceptions of grasping at coarse and subtle ordinary activity in all its forms, embrace them with the threefold adoption of the true mode of abiding [of form, sound and awareness as deity, mantra, and wisdom]. Be established in that state! “Thus, by the virtue exemplified by engaging in this meditation-recitation, through all the masses of virtue existing in the mental continuums of myself and others, by means of this unparalleled gathering of merit impartially dedicated to infinite beings, may I very quickly attain the unsurpassed level of equality with the Sovereign Arya Avalokiteshvara, and may all beings without exception, who have been my mothers, attain the power enabling them to become established in sublime unexcelled complete enlightenment inseparable from the level of the Noble Great Compassionate One!”. It is taught in The Root Tantra of the Lotus Web that if one meditates upon and contemplates again and again the embodiment of all the Victorious Ones of the three times without exception, the exalted form of the Noble One, then even extremely serious karmas of immediate retribution can be purified. Even just to hear this heart-essence of the Dharma, the supreme speech of the Six Syllables, and to recite it, to bring it to mind and so forth closes the doors to rebirth in the six classes of being, propels one on the paths and levels of the six transcendent perfections, and through it, the stains of karma, disturbing mental states, and habitual tendencies are purified, as well. Stir up samsara from its depths! Thus, in the Taiwanese city of Taipei, in response to the request of the honorable Lama Jangchub, a holder of the treasury of the three trainings from the Dharma center Drodön Kunkhyab (For the Benefit of Beings Pervading Space), the one who holds the tulku title of Sangye Nyenpa the 10th, in the year 2006, on the first day of the first Tibetan month, wrote this with prayers to the Supreme Noble One, the Great Compassionate One. Thank you for this great translation ! Is any form of initiation or empowerment required to practice this sadhana ? If so, will any form of Chenresig empowerment already received be sufficient ? In my own experience, empowerment is not required for Chenrezig sadhana practice (i.e. 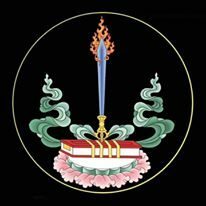 Chenrezig empowerment). There are some lamas who say that you should never engaged in visualizing yourself as a deity unless you have received empowerment into that deity, and some lamas who say that for certain very peaceful deities, such as Chenrezig and Green Tara, it is alright. Yes, any form of Chenrezig empowerment would be sufficient, although certainly there is a specific empowerment lineage associated with this particular practice. Just to clarify, I personally don’t recommend visualizing yourself as a deity unless you’ve received empowerment in general, except for maybe Chenrezig and maybe Green and White Tara. But that’s just my own opinion, and you should ask a lama. Thank You for your work here Erick Tsiknopoulos (Sherab Zangpo) and Mike Dickman. We Will be using this condensed Chenrezig Sadhana at Home daily as well as with visiting friends & Family.